Wastewater streams aboard the two state-of-the-art EcoCoasters Dutch shipyard Royal Bodewes is building for Finland’s VG-Shipping will be managed by a bespoke treatment system designed by ACO Marine. Both 4,700dwt EcoCoasters Eeva VG and Mirva VG, due to be delivered this autumn to VG-Shipping, the ship management arm of the Meriaura Group, feature MEPC.227(64)-compliant Clarimar MF-1 treatment plants. Fully type-approved by Bureau Veritas to meet MEPC 227(64) and EC MED module B, the ACO Clarimar MF can reduce Coliform bacteria to 25/100ml,TSS to <14mg/l, BOD to <3mg/l, and COD to <25mg/l. The compact systems supplied to Eeva VG and Mirva VG, currently outfitting in Papenburg, Germany, each have a wet weight of just 1,640kg. Like all ACO Marine products, the Clarimar MF is manufactured entirely in the EU from high performance materials which, unlike coated black steel, is completely corrosion resistant and light weight, the system’s modular design affords simple installation and requires only one power connection. From an operational perspective it is has the lowest running costs of any sewage treatment plant on the market. Uusikaupunki. 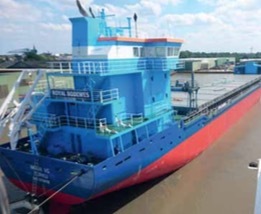 Fuel consumption is almost halved compared to other dry cargo vessels of this size and class. Established 15 years ago, ACO Marine is a member of the international German-headquartered ACO Group and a leading supplier of advanced wastewater treatment systems to the global commercial, naval, offshore and leisure marine sectors with a sales and service network world-wide. Its unique environmental solutions are used primarily in wastewater technology, wastewater management and drainage systems. The wide range of products includes advanced membrane bioreactor systems, conventional extended aeration with ‘bio-sword’ filtration sewage treatment plants, push-fit pipe systems in both stainless and galvanized steel and fully automated high capacity grease separators.ACO Marine develops in- house solutions from its ISO 9001 accredited production facilities, all of which are located entirely within the EU.